So, here is an image I captured in the Kgalagadi Transfrontier Park recently. Given, it's not a clearly recognisable image at first, and it's not going to be everyone's cup-of-tea...but I felt like sharing it anyway. 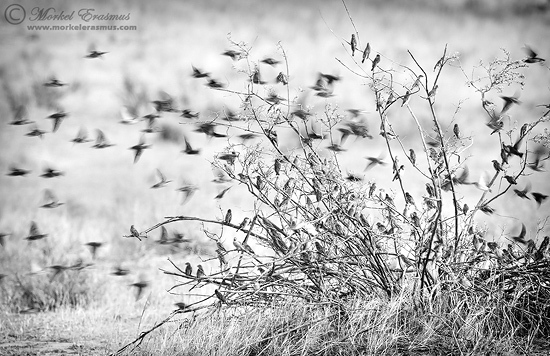 Most mornings when you drive out from the Twee Rivieren rest camp up the Nossob riverbed, you see flocks of Red-Billed Quelea move to and fro between shrubs and bushes, looking for food. I looks like an orchestrated wave, and almost like a "swarm". I tried to capture something of this behaviour when they perched on a shrub for a moment. I used a slow shutter speed to enable me to capture a blur of birds as they took off, and hoped for some to remain on the shrub (and to be fairly sharp). I like it. Nothing wrong with some motion in a shot and you can clearly see it is about birds. Definitely my cup-of-tea! Very well executed shot!